Group using the FO1 and FO2 firmware for Ford SYNC retention * see specific firmware for full feature list. Got my Maestro RR working pretty well with my 09 Lincoln MKZ (flashed as 08 to retain XM). No problems with Sync integration, reverse detection, etc. However, I'm having an odd issue where my illumination wire isn't passing to the Pioneer correctly or something. I definitely have the orange/white on the Pioneer connected to the orange on the Maestro, but toggling the headlights does not change the illumination level on the HU. Additionally, the Pioneer appears to have a status screen under "connection status" where "illumination" is stuck at off, so it appears to be a wiring issue or something. Any ideas? It's a minor issue, but this setup is for my wife, and her stock stereo dims just fine when the headlights turn on, and I'll never hear the end of it if I can't retain that. 1) The instructions said to connect Aux since it's a Pioneer, but even though the Pioneer knows I'm using a Maestro, the Aux input is still enabled. If I select it, I hear my OEM XM (although I obviously have no control over it in that mode). This is expected behavior, correct? Just want to be sure that connection is necessary. 2) After messing with the Sync phone and the Maestro, I'm probably just going to use the HU's BT for calls. Is anything gained by reflashing and deselecting that part? In the meantime, I simply told the HU to use the radio instead of Sync for hand-free calls, and so far so good, and it seems fine, but I'm not 100% sure that is all I need to do. 3) I tried to assign Siri/Voice to a press-and-hold steering wheel button, but it does not appear to work correctly. A weird "discover devices" screen comes up even when paired to the HU BT (not to mention it takes like five seconds of holding to get it to show up). Pressing the microphone button on the HU correctly starts the Google Assistant prompt. I figure this might be related to question 2 and me having Sync phone flashed to the Maestro, but hoping for help on that. 4) While it's awesome to retain OEM XM, it looks like I'm not receiving album art. I assume this wouldn't be an issue if I used the XM in the HU. Is this a limitation of my OEM tuner? The Maestro? Thanks so much for all your help. Your support has been very helpful. The bad news, on some older vehicles not all of the information is shared over the systems databus lines. The good news is that the illumination wire in the vehicle is pretty simple to get to and can be found in two locations. 1- driver kick or 2- SJB/dash fuse box, conn. A, pin 31 and in both locations it will be a grey/yellow wire. 2- By flashing it without Sync you remove that option to choose. If the battery dies or drops below operating voltage it may revert back to using Sync which can cause some confusion for the wife. If you are going to use the radios BT I'd personally reflash without it. 3- We may have to revisit this when you reflash the module. Thanks, Justin. I did some additional testing on the illumination situation, and as expected, I'm not seeing 12v on the wire coming from the RR with flashing as either 08 or 09 MKZ. I was going to tap into the actual illumination wire from the factory harness and just bypass the RR for that, but I checked the wiring diagram, and it looks like it's over CAN bus (or something else) in this car since I don't see a wire for that on the pin-out. Are you saying the RR wouldn't be able to pass that data and I should just tap into either of those locations you mentioned for it? Obviously the RR would be easier than running a new wire, but it isn't the end of the world if that is what I need to do, and I appreciate the pin-out help. Thanks for clarifying questions 1, 2, and 4. For question 3, I reflashed without Sync BT, but the issue was still there. I did additional testing, and I figured out what is going on. Basically, when I tap the microphone button on the HU, it launches Siri/Google Assistant. When I hold it down, it launches the useless (IMO) AppRiver mode, and that's what the "Discovering Devices" screen was. For whatever reason, if I assign the Siri/Voice action to a push-and-hold button on the RR, it acts like a push-and-hold on the button itself. If I assign it to a tap on the RR, it acts like a tap on the HU button and launches fine. Is this just a limitation I need to work around, or is there an easy fix? Personally, my ideal situation would be a tap launches Google Assistant while a hold launches Sync media, but I think Sync media is hardlinked to a tap action on the voice button and cannot be moved, and if the press-and-hold action does not launch it correctly, I might need to shuffle some button actions around. Thanks again! Are you saying the RR wouldn't be able to pass that data and I should just tap into either of those locations you mentioned for it? Obviously the RR would be easier than running a new wire, but it isn't the end of the world if that is what I need to do, and I appreciate the pin-out help. For some reason Yes, we are able to read the vehicles messaging. We will need to hardwire it in this case. Seems like this is just a limitation of the radio and how it is seeing the command being sent. might have to stick with a single tap to ensure proper functionality. Unfortunately, the sync commands can not be remapped. 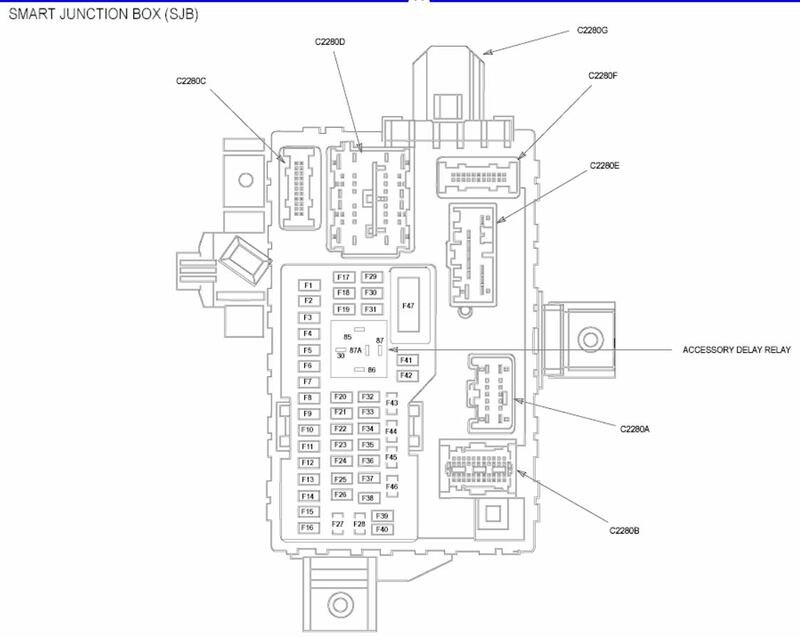 I was going to wire up the illumination circuit this weekend, but I took a look at my diagram, and I don't see a pin 31 on connector A at the SJB. Unfortunately, I'm not very good at reading these things, so I might just be missing something. Any chance you can confirm that pin is correct? My initial plan was simply to wire into a dash light, but both the diagram and my testing confirm that nearly every internal light that activates by the headlights are on PMW and controlled by the dimmer, so unless I'm going to run at full brightness, I doubt it is going to output 12 volts, so it's back to the SJB I go. If you have a DMM, pull up the drivers kick panel. running along the sill plate is the harness that goes back to the tail lights. in that harness locate the grey/yellow wire and test it with your DMM set to DC voltage to confirm 12v are supplied when the parking lights are on. once confirmed make the connection and put the kick back together. I was stupidly looking at the diagram for the 2010 MKZ and not the 2009, so that's why I wasn't seeing what you were. Anyway, my wiring diagram matches up now. Tried to jack into the wiring behind the kick panel, but it was all sheathed in plastic and difficult to access without ripping the entire loom open. Finally just sucked it up and tapped into the SJB at the pin you mentioned. I'm reading 12V on the DMM with the parking lights on and 0V with it off, so it looks to be behaving as intended. I'll wire it up next time I rip the radio out. Thanks for your help. No worries and thanks for choosing ADS Maestro.